Dragon finds himself in a dream where he explores the mind of William Jonson in search of the man whose body he inhabits. A shadowed figure appears but Dragon slowly regains consciousness back in Hillman Hospital where a number of friends are waiting by his bedside. There is some confusion about whether it was William or Dragon waking up but after a few words, Frank Darling soon realises that it is Dragon still in the driving seat. There has still been no trace of William’s mind since he was shot in the head by his brother and Dragon is concerned that he may be completely taking over the body. Frank points out that when he gave blood to Phil Dirt that the transformation for Phil was instant so this is presumably something else. Rita Medermade is not coping with any of this and is comforted by Alex Wilde. Smasher arrives in Dragon’s recovery room and informs him that his severed arm has recently emerged up from the ground. Angel Murphy takes over telling the story to recite how the limb was gathered up by Cadaver as string sewed it onto a makeshift body consisting of numerous corpses. Cadaver’s threat to kill Dragon off for good was relayed and Dragon knows that he must confront the villain. Rita pleads with him to avoid any action that may further cause William to truly die. She announces that she is pregnant with William’s baby and cannot bear the thought of having their child without him. Dragon knows that he must finish his fight with Cadaver, hoping that spell that was used to bond him and William together can be reversed. Rock gathers together all of the superheroes that had taken part in the rescue mission to Godworld, both former captors and the rescuers. Kill-Cat finally understands that he has been brought to Complex One under false pretences and that the S.O.S. has no intention of recruiting him. Rock wishes to know what truly happened to destroy Godworld and Kill-Cat is likely candidate for being responsible. 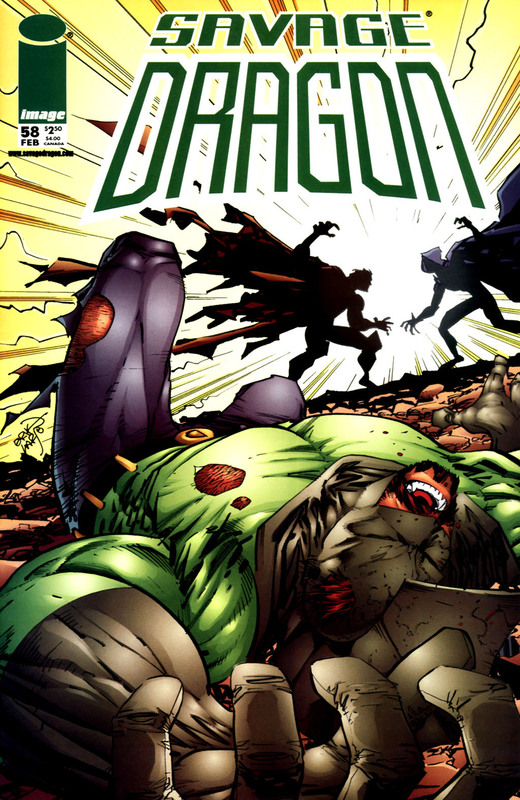 Dragon is taken to his own gravesite to witness first hand where his arm burst out through the ground and he explains his current situation to Smasher. His apparent death at the hands of Cadaver merely resulted in his essence bonding with the body of William Jonson and he has been trapped inside ever since. Dragon is determined to find a way to save William and restore his own life but is fully prepared to die trying. Smasher begs for him not to risk too much as she confesses her love for him, the good news overwhelming Dragon. He is tempted to forget about facing Cadaver and instead heading off to sleep with Smasher but knows that he has greater responsibilities to worry about. The story about how Godworld blew up is finally revealed as Kill-Cat explains how the Kid Avenger had dragged him into a room. A cube of energy had been floating in the air and it seemed likely to be a power source for the planet. The Kid Avenger suggests that he cause a surge in energy to create a distraction but Kill-Cat says not to, not wanting to risk a repeat of what happened to Detroit. He had taken the blame for that disaster and has no desire to take on more responsibility. The Kid Avenger proceeded with his plan anyway and ended up causing a chain reaction that destroyed Godworld. Rock reviews everything that was said and makes a connection to a number of past events. The Kid Avenger had accidentally caused Godworld to explode. He had also accidentally caused Detroit to blow up during the Martian invasion. The Kid Avenger accidentally caused portions of Darkworld to transfer with parts of Earth when he could not figure out how to work the virus needed to prevent it and he also accidentally caused Dart’s legs to be shot off. Rock fires the Kid Avenger for incompetency and leaves him begging Kill-Cat to let him reform the Deadly Duo with him. Alex Wilde stops by the cemetery to speak with Dragon, informing him that Chris Robinson and her have given up on restarting their relationship and that Chris has returned to being Star. Their conversation is interrupted when Cadaver makes his move against Dragon and a fight breaks out. Dragon has his own arm punched through his chest before Cadaver begins to finish the spell that would dissolve him into nothingness. The villain is suddenly incinerated as the figure that Alex had once seen hidden beneath the leeches of Horde returns. This mysterious man destroyed Cadaver’s corpse body but it is revealed that his true form is that of a sentient, evil length of string. This twine flees as the mystic restores both Dragon and William to their true bodies. He is about to leave when Dragon queries about who he is, learning that his savior is named Fon~Ti. Cadaver and Fon~Ti have waged war with one another for ten thousand years and it was during a period of weakness that Cadaver imprisoned him with the Wicked Worm leeches, creating Horde. The leeches had been an answer to Fon~Ti’s own creation, an eternal entity of goodness. With the threat of Cadaver over for the time being, the enigmatic Fon~Ti announces that he will depart and that they will never see him again.